The Clip and Clip Individual drawing templates in the Transform panel and GeomClip function in SQL cut objects using areas. 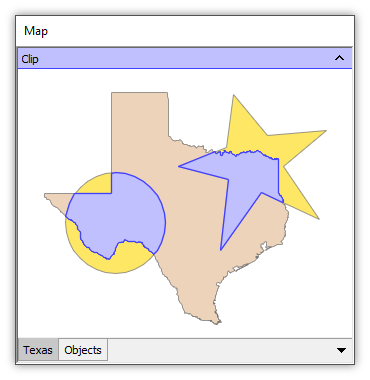 The Clip template cuts all objects in the target drawing using areas in the Clip with drawing. 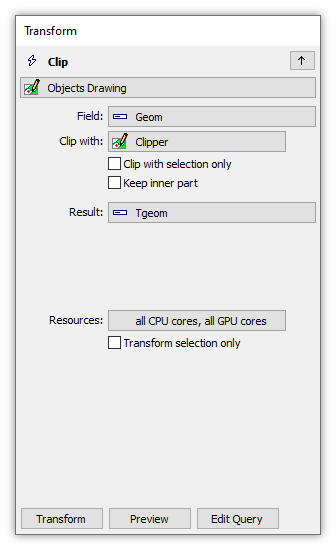 The Keep inner part checkbox regulates what is left after the clip. Checking the Keep inner part checkbox leaves only those portions of objects in the target drawing that are inside of the Clip with areas. 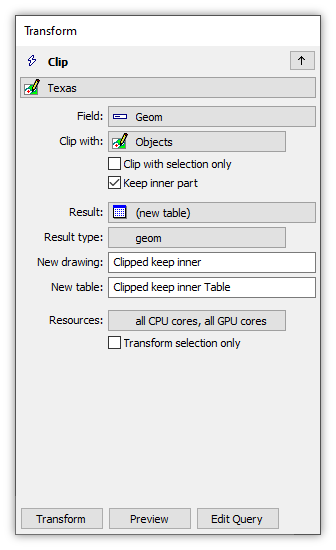 Unchecking the Keep inner part checkbox leaves only those portions of objects that are outside of the Clip with areas. Previews are slow with many complex objects. Even if we do not wait for the preview to appear, the Clip will still be done correctly. The actual Clip operation is also slow with many objects or complex objects, even though it is fully parallel. Upcoming builds will increase Clip performance. 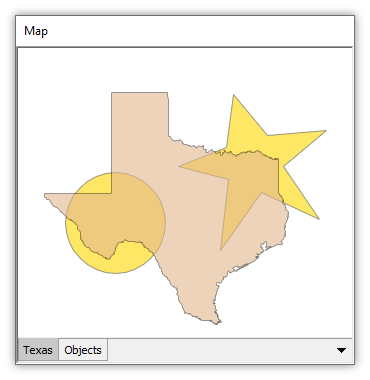 Consider a map that has two drawing layers: a drawing that shows Texas as an area, and a drawing called Objects that has a circular area and a star-shaped area. The map uses 50% opacity for layers to better show overlaps. 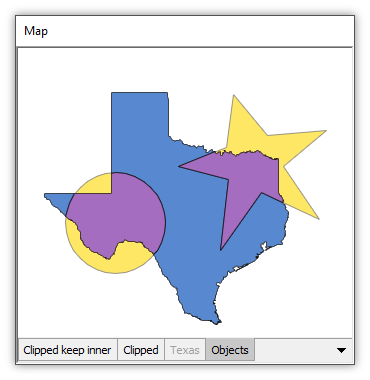 With the focus on the Texas layer we choose the Clip template to clip the state of Texas with the circle and star objects. We choose the Objects layer in the Clip with box and we leave Tolerance at 0 meters for automatic tolerance. We leave the Keep inner part box unchecked, the default. 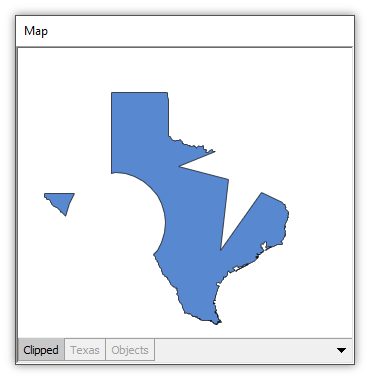 The preview shows that all of Texas within the Clip with layer's areas will be clipped. To clip Texas with the circle and star and leave the inner part, we check the Keep inner part box. 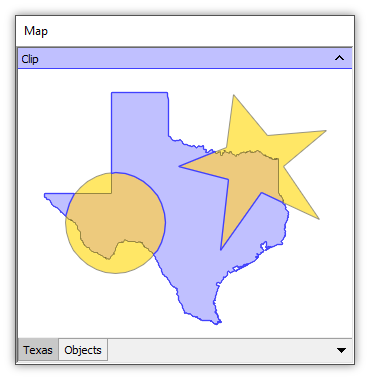 The preview shows that all of Texas within the Clip with layer's areas will be retained, with all of Texas outside of the circle and star removed. We can show both results layers, and also turn on the Objects layer with styling to showing just the borders of the circle and star as faint yellow lines, to see how the different areas created by the Clip and the Clip using the Keep inner part box relate to each other, and to the objects that were used as the Clip with objects. 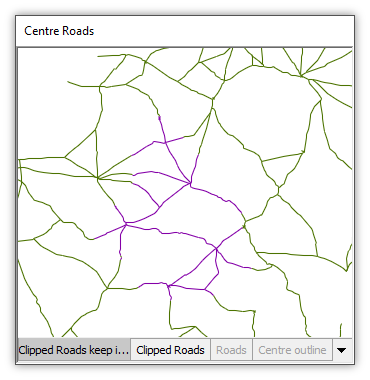 Consider a map that has two drawing layers: a drawing that shows the French region of Centre as an area, and a drawing called Roads that shows Roman roads in Europe as lines. We will clip the Roads lines using the Centre area. 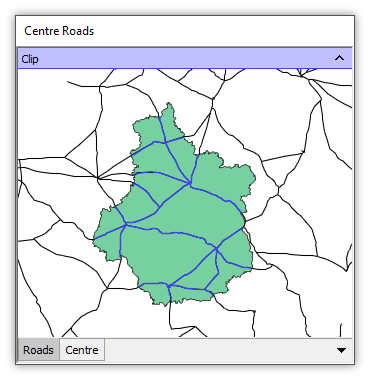 With the focus on the Roads layer we choose the Clip template to clip the roads with the region of Centre. We choose the Centre layer in the Clip with box and we leave Tolerance at 0 meters for automatic tolerance. We leave the Keep inner part box unchecked, the default. The preview shows that all Roman roads within the Clip with layer's area will be clipped. Pressing the Add Component button creates a new drawing as seen above. 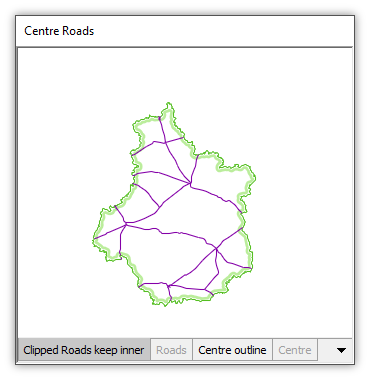 We show the outline of the Centre area using a style that shows the area's border in faint yellow, to better show how the roads were cut out by the Centre area. To clip the roads layer with Centre and leave the inner part, we check the Keep inner part box. 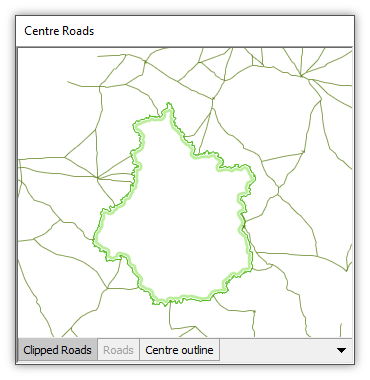 The preview shows that all roads within the Clip with layer's area will be retained, with all roads outside of Centre removed. Pressing the Add Component button creates a new drawing as seen above. 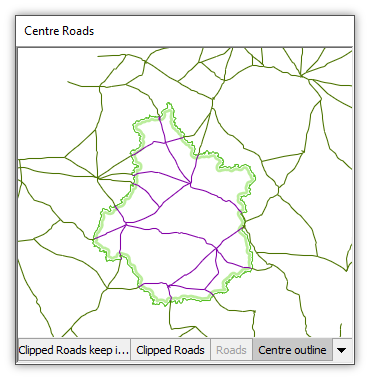 We show the outline of the Centre area using a style that shows the area's border in faint yellow, to better show how the roads were cut by the Centre area. We can show both results layers, and show the results layers with the Centre layer as a faint outline. This illustrates how the different sets of clipped roads created by the Clip and the Clip using the Keep inner part box related to each other. 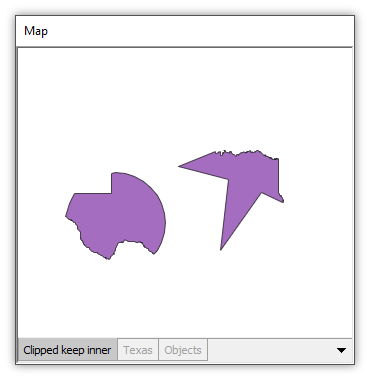 The Clip template works using areas in one drawing to clip objects in a different drawing. The Clip Individual template works within a single drawing that has two different geom fields for each record in the drawing's table. For each record, one geom is used to clip the other geom. Clip Individual works only within each record: geoms within a given record cannot clip geoms in other records.